I have an artistic problem: when I attempt looseness and spontaneity, I risk merely achieving crappiness and crudity. 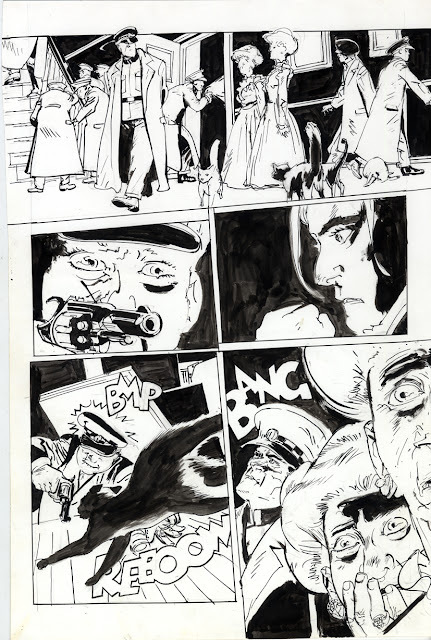 Tony Salmons, on the other hand, is one of those artists, like Jordi Bernet or Joe Kubert, who can pull it off, get away with it, as it were. Tony bragged to me that he had to get drunk to get to the place where he could shut down his internal censors enough to produce the effects seen in these pages. I’m reminded of Alan Watt’s anecdote about the Sumi-e painter (or was it Chinese calligrapher) who got plastered before he executed his magnificent paintings using his beard dipped in the ink. Alex Toth’s influence is seen clearly in the sfx lettering, executed on the original page itself.